Meet Monty, Mimi and Oscar. 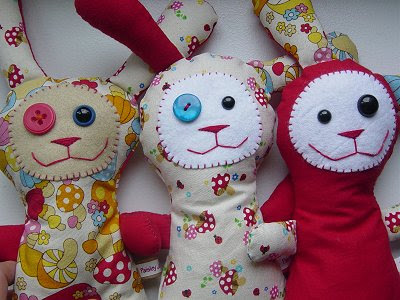 Three little mushroom bunny softies awaiting adoption in "Paisley Jade's Softie Shop". My favourite is Oscar, and Mandrake's is Monty... what about you? They are just way too gorgeous .... the mushrooms too divine! I only ever get great comments about Fifi - she's lovely! So hard to choose..I think Oscar!